The Fes Watch U doesn't look to be the smartwatch Sony fans have been clamoring for, but it's an inventive idea. The price is extraordinary though. Sony has been showing off its e-Paper concept devices for a long time, but this new smartwatch from the company marks the first time one will be available to buy in real life. The Sony Fes Watch U is a unique device in that it allows the display to carry around the watch face down onto the strap itself. It does this as the whole screen wraps almost the whole way round the strap using e-Paper technology. That's a similar tech to what you see in Amazon's range of Kindle devices, and it allows a variety of different designs to be constantly on display around your wrist without an extraordinarily short battery life. Be warned - this isn't a typical smartwatch like the Apple Watch or a Wear OS device. Instead it's a fashionable piece of tech that's doing something a bit different, but different may be what some are looking for in 2018. You'll be able to buy the Fes Watch U in mid-September this year if you live in Europe. So far a release date for around the rest of the world has been unclear, but if it sells well in Europe we may well see it come to other countries soon. The remarkable thing here is the price. 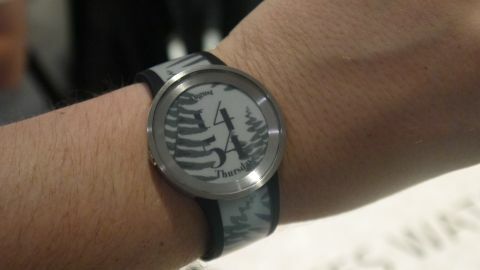 In the UK, the watch is set to start at £529 (about $690 / AU$940) while another version is a whopping £699 ($900, AU$1250). The price difference between the two models is down to the glass used to protect the watch, but either way these are both expensive. The more expensive Sony watch is using a more durable glass, so it's less likely to scratch. The design of this watch is the big highlight. It's covered in an e-Paper display (a similar technology to E-Ink that you get on an ereader), and it's able to change whenever you want a completely new design. It's not just the watch face that changes, the strap takes on a new design all the way down until you get near to the clasp that holds the watch on your wrist. Rather than just having a customizable watch face, this e-Paper tech means you can change the whole design of the watch at a moment's notice. e-Paper tech is only so advanced. This smartwatch is black and white, so you won't be able include any color designs on the Sony Fes Watch U. There are 100 designs pre-loaded onto the watch, and you can quickly switch these up through an app on your iPhone or your Android device that's paired with it. You'll even be able to make your own designs that you can load onto the watch. Some of the designs we've seen have just shown patterns all over the watch, but others also include a watch face that can tell the time. Unlike your average smartwatch, this is all you'll be able to do it. It won't be able to track your location, give you notifications or anything else. It's just for telling the time and to look interesting on your wrist. The idea of being able to make your own designs is something no other smartwatch offers, and some of the ones we've seen looked really inventive. The watch itself isn't bendable – the screen is fixed in place. It's a single strap that felt comfortable on our wrist after moving the strap slightly, and on the rear is a clasp to ensure it sits comfortably. We changed the size of the watch in our testing time, and it didn't take much effort. Sony estimates the watch should last for a whole two weeks from a single charge. Considering it won't be doing much more than just displaying a design, we hope this battery estimate will be the same for all that use the watch. There's a three pin charging port on the back that will work with a charger included in the box, but here's no estimate for how long it'll take to recharge. The Sony Fes Watch U is an incredibly expensive device considering its very limited functionality, but if you love the look of this watch it may be worth that amount as a fashion accessory. This isn't designed for your average smartwatch fan. It's a much more fashion-led piece of kit and if you want to have a watch that looks unique as well as change look in a matter of a few taps on your smartphone screen, this could be the watch for you.